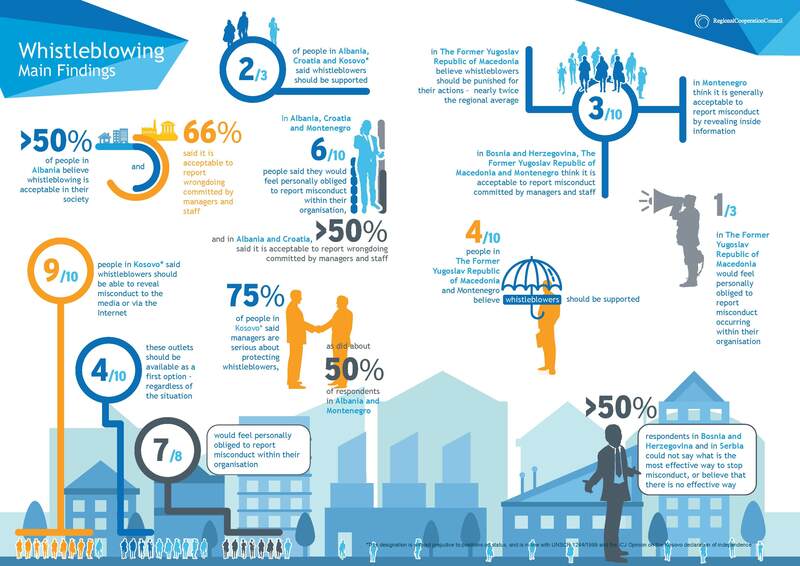 Sarajevo – Attempting to raise public awareness against corruption in South East Europe (SEE), the Regional Cooperation Council (RCC) surveyed what the public in the region felt towards the whistleblowing, as one of the highly effective tools to expose corruption, crime and other serious wrongdoings. The data analysis of this opinion survey, on both the Whistleblowing and protection of Whisltleblowers named ‘Public Attitudes to whistleblowing in South East Europe’ has been published on the RCC’s website. The report, for the first time, examines how citizens in South East Europe view whistleblowers and the practice of whistleblowing. The analysis based on a hard data is the result of surveys of 7,000 people from seven SEE economies. “Corruption and inefficiency in tackling it continue to be a great concern of societies throughout the SEE. However, as this survey proved, these concerns have not yet been translated into strong public support for whistleblowing”, said Radu Cotici, RCC’s Expert on Governance for Growth. This survey of citizens’ attitudes to whistleblowing in SEE region shows an underlying pattern of relatively weak support for whistleblowers. Only slightly more than half of 7,000 people surveyed region-wide said whistleblowers should be supported, and only about a third said whistleblowing is acceptable in their society. On top of this, one in six people said whistleblowers should be punished for their actions. Whistleblowing is seen as one of the most efficient tools to fight and expose corruption. Organizations like the Council of Europe and the United Nations Office on Drugs and Crime have developed international standards in this field, while most of the governments across the SEE region have put in place laws related to protection of whistleblowers, explained Cotici adding that continuous efforts would have to be made to significantly affect the public opinion in favour of the whistleblowing method. The overall objective of the Anti-corruption Dimension under the Governance for Growth pillar of the RCC’s SEE 2020 Strategy is to formulate coordinated regional measures that seek to reduce corruption in public administration, to improve government effectiveness and to enhance business environment. One of the key measures envisaged by the SEE 2020 Strategy is increasing public awareness against corruption by actively supporting the efforts of researchers, whistleblowers and other agencies active in this area, as well as by helping to give ample publicity to their findings.